Gamers today know well of the success GameFreak has enjoyed. As the creators of the immensely popular Pokémon games, the company has been riding a wave of hits for well over a decade. 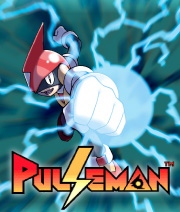 Genesis owners know GameFreak as the creators of the Japan-only platformer Pulseman, a great super hero inspired title that was never physically released outside of the Land of the Rising Sun. Fortunately, Pulseman got a chance to show western gamers its quality when it debuted on the Nintendo Wii’s Virtual Console service in 2007. To celebrate that release, Sega of Japan’s Sega Voice interview series spoke to Pulseman’s art director and game designer, Ken Sugimori on April 24, 2007. Sega-16 presents the fully translated review, courtesy of Alex Highsmith of shmupilations.com. Ken Sugimori is responsible for the graphics and character design of various Game Freak games, including Mendel Palace, Pokémon, and more. Together with Satoshi Tajiri, he worked as art director and game designer for Pulseman. He has also directed Magical Taluluto-kun and Drill Dozer. 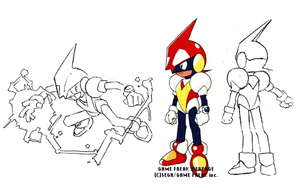 Sega Voice: Before making Pulseman, how did you get involved with Game Freak and Sega? Ken Sugimori: When Tajiri was a student, he was a game design contest held by Sega… so you could say that was the beginning. Tajiri would often come over to play video games with me, and winning the contest gave us the impetus: “why don’t we try making a game ourselves?” That first title we made was “Magical Taluluto-kun” for the Mega Drive. The ideal character game… that was our goal for Taluluto-kun. We strove to create something that fans of both the manga and video games could appreciate. To our delight, Taluluto-kun received good reviews after its release. That made us think, “What if we made an original game this time?” And so, Pulseman was born. Sega Voice: The Voltekker system in Pulseman, where you become electricity and zip about at high speeds was a defining characteristic of the game. How did you come up with that idea? Along the same line we thought, if Sonic is blue, Pulseman will be red! If Sonic can run in 360 degree loops, then Pulseman will move in a rectilinear way, which will also help evoke that feeling of snappy, reflexive movement in players. That was the root of both the Voltekker move and the “wire action” travel along electricity lines. Sega Voice: It’s been 13 years since Pulseman was released on the Mega Drive. How does it feel seeing it again on the Virtual Console? Ken Sugimori: Well, when Pulseman was released, there were no computer networks: not even modem connections. In that sense it feels like making a game about a “networked world” was very prescient. The futuristic world of Pulseman, where computers are everywhere, feels very close to the world of the internet today. I also remember the stage one boss. He uses a headmount display and attacks Pulseman with a virtual fist. He’s strong in this virtual world, but in reality he’s just a weak boy who Pulseman can defeat in a single punch. When I saw the stage one backgrounds, even after all these years I thought, “wow, they look good.” We spent a lot of time on it, going over every detail. Pulseman was my second attempt at game direction, and my policy was that the first level must be easy. Unfortunately, looking back on it now, I realize that although it was an easy first stage, it also didn’t really convey the strengths of the game too well. Honestly, that is something I’ve really had time to reflect on. When I made the first stage of Drill Dozer, an action game we release two years ago, I was took special care to ensure the first stage was fun to play. Sega Voice: I’ve heard you’re quite the Sega fan. Ken Sugimori: Indeed. It was games like Star Jacker and Flicky that made me a Sega fan, I think. I fell in love with the unique graphics, where animals would have this strange metallic shine to them. After that I became I Sega fan – “how are their games so beautiful? !” I started playing all their games. Compared to the arcades, the first SG-1000 system seemed pretty weak to me then. “What the hell is this?” (laughs) But the Mark III looked really great, and I bought it and a lot of games, too… Teddy Boy Blues, Pit Pot, and more. I don’t even remember how many loops I completed of Astro Flash. Sega Voice: And I understand you have a special love for the Mega Drive? Ken Sugimori: Yeah, I just love the design of that console. Even when I see it today, I think it’s so cool. I remember the impact I felt, having the Mega Drive, Mega CD, and Super 32x all hooked up. (laughs) I had that set up going on my desk at home for a long time. You could power it on anytime… it took three outlets, though. I didn’t have any money back then, but I still managed to buy games. I especially loved Phantasy Star II. The unpredictable way the story unfolded had me riveted. I beat Phantasy Star III multiple times so I could see all the endings, too. As for action games, they aren’t very well-known, but I also liked Kujakuou 2 and Jewel Master a lot too. I loved the dark colors they used. Of course, I loved Super Shinobi and other big titles too. Sega Voice: What games have you enjoyed on the Virtual Console, and what would you like to see released? As for games I’d like to see released… how about King Colossus and Majin Saga? I especially recommend King Colossus for its dark atmosphere. Sega Voice: Do you have a final message for our readers? Ken Sugimori: For players today, there may be some sections of Pulseman that are very difficult. But I think it’s packed with innovation that more than makes up for it—it’s a game full of our youthful vigor. I also think it will be very interesting for players today, living in a fully networked world, to see what our vision of a cybernetic society was like back then before the internet was a reality. I hope you enjoy seeing the differences between what we thought the world would be like and what actually came about. There’s certainly some amateur moments in Pulseman, but it was a world we really poured our hearts into, so I hope you enjoy experiencing it.